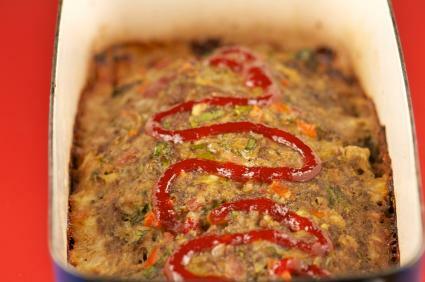 Meatloaf is one of America's favorite comfort foods. It's easy to get into the habit of making the same type of meatloaf every time you prepare the dish, but there are actually many different options. Mexican meatloaf, for example, is a great dinner option for summer time or any time you feel like making something with a little kick. Firmly pack the meat mixture into the pan. Bake at 350 degrees Fahrenheit for 1 hour and 15 minutes. Allow to sit for 10 minutes before cutting. Garnish with ketchup or additional salsa, if desired. Make the recipe truly homemade by making your own salsa to go in the meatloaf. Slice the jalapeno pepper (be sure to wear gloves). Remove jalapeno pepper seeds and membrane (optional - this reduces the "heat"). Place all above ingredients in a bowl. Squeeze the juice from the lime into the bowl. Refrigerate at least overnight before using in the recipe or serving. Place whole peppers on the broiler pan rack. Broil about two inches from heat source. They are ready when skin is blistered and broiled - expect this to take about 5 minutes. Place peppers on a plate and allow to cool. When they are cool, peel off skin (wear gloves when handling). Slice open and remove seeds and membrane. Regardless of whether you tackle the tasks of making your own salsa and roasting your own peppers, this new meatloaf recipe is sure to quickly become a new household favorite.